In very rare cases internet plagiarism can actually be a good thing, but usually, it can make your life much harder. Have you written a perfectly legit paper but then was flagged as SPAM? This happens quite a lot in articles when there are certain types of words that have been repeated far too many times in just one paper or when the word or words that you are using triggers a red flag in many programs that filter spam words. How then will you be able to correct this problem? There are two ways to get this done. One, you should rephrase your text and the other is to learn which words are considered as spam. You might be surprised to find that there is quite a long list of words that are considered spam but you just need to start with the most basic so you will know which ones to avoid when writing your essay. The problem with writing articles is that there is a tendency to use specific words over and over again throughout the entire paper. Keep in mind that search engines go through various websites to find search words or keywords typed in by the user to find appropriate sites to include in their list of results. If your article contains words that are considered as SPAM, you will be missing out a lot of opportunities to get your work out there because the anti-spam filter will kick in thus pushing your site aside. This is something you don’t want to happen especially when you’re handling a company website or blog. The good news is that there is a way around this and that is to paraphrase your content. This is possibly the easiest way to avoid your article getting flagged. If you are not really sure how to get this done fast, you might want to consider hiring our writing service because this is what our business is all about. Try our essay reworder to get quick and professional results! It’s quite frustrating to find that your paper is delivered to the SPAM folder of the recipient because it contains words that have been red-flagged by anti-spam filters. This can lead to numerous problems especially when you’re paper must be sent immediately. If you want to ensure that the paper you will be sending will be delivered properly, you should take a look at this list of the most basic words that have been red-flagged in many anti-spam programs so you can avoid them. Although using a word or two in your paper won’t cause the anti-spam filter to flag your work, the frequency of the words in your article may do it. This is why you need to check how many times you have used that specific word in your article so you can find a replacement word instead. If you are not comfortable with the way your paper turned out or if you want to minimize the chances of your paper getting flagged, it wouldn’t be a bad idea to hire our service. With our help, we can revise your article so that words considered to be spam will be spotted and replaced immediately. If your paper contains spam words, you will have less chance of getting your work noticed because of anti-spam filters. The best way to get around this is to rephrase your sentences as needed until you create unique texts without any spam. There are few possible ways of solving this issue. Firstly, you can spend hours on discovering lists of spam words and practicing paraphrasing, that will bring you needed result within some time. And what to do when you have limited time but need quality content? One of the best options for you can be looking for a person who is experienced in paraphrasing and know how to avoid plagiarism and spam words. In the case when your goal is excellence but you are doubting about your writing skills you can rely on our team of professional writers. You only need to hire our service to get this part done because our writers know which words are spam and which words are not. 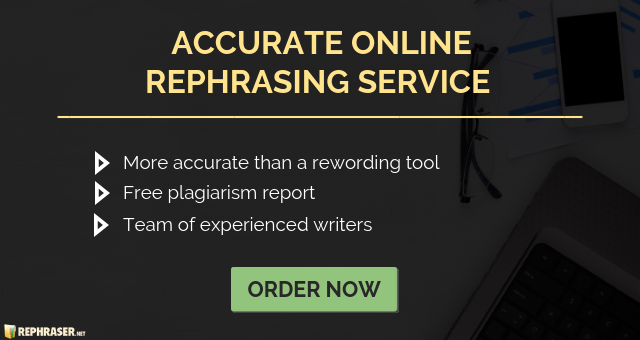 Our paraphrasing service has been around for years and we can guarantee accurate and reliable paraphrasing assistance. Don’t think twice but let our experts provide you with the best service! Hire our service today in order to get a perfect paper without spam words! ← Is Content Rewriter Software Trustworthy Enough?